Are you a technical artist looking for the best software that can help you draw different kinds of diagrams, flowcharts and presentations? Then Microsoft's Visio 2016 could be the best choice for you. Read on to know what it has got to offer. Microsoft Visio which was earlier known as Microsoft Office Visio is a diagramming and vector graphics application that belongs to the Microsoft Office group. 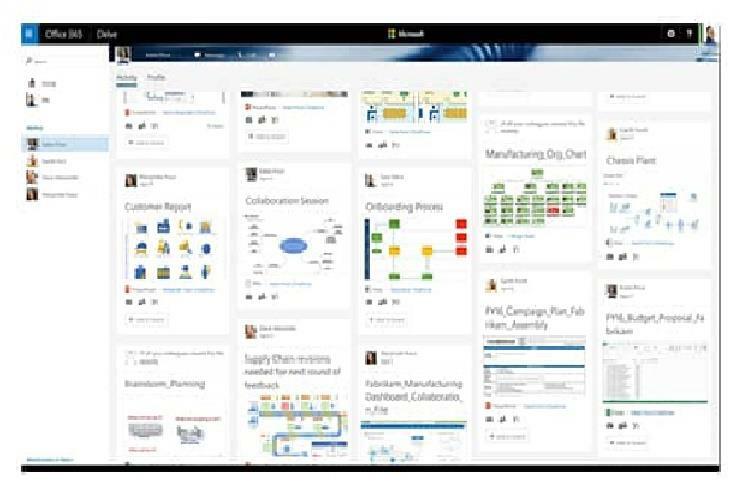 In 2013 Microsoft launched the productivity Application Visio in Standard and Professional editions. In 2015, 22nd September, Visio 2016 got released together with Microsoft Office 2016. A handful of new features is added to this latest edition along with the new themes for the Visio interface, a complete makeover in the office layout, protective measures for the exclusive Visio files, the information rights management (IRM), one-step connectivity with Excel data, minute detailing in the site plans, a whole new range of shapes for the floor plans, latest shapes updated for home plans, new range of starter diagrams, IEEE compliant shapes for electrical diagrams, and in this version the Database modeling is based on a Database Model Diagram. The changes made to the latest versions of 2016 are common in both the Professional and Standard ones. It is all about incorporating powerful diagramming application that works for the users visually to help in creating every kind of diagrams. The other feature added to it is the benefit of getting a Preview of the app online. They have made it all easy for the users to share their Visio diagrams that would get saved as .vsdx format and they will also enjoy data connectivity through SharePoint Online or through OneDrive for the Business edition. This would make the work more visually appealing when presenting to a big professional group as they can now browse them through their web browser. The other changes include a more convenient, intensely integrated collaboration functionality. 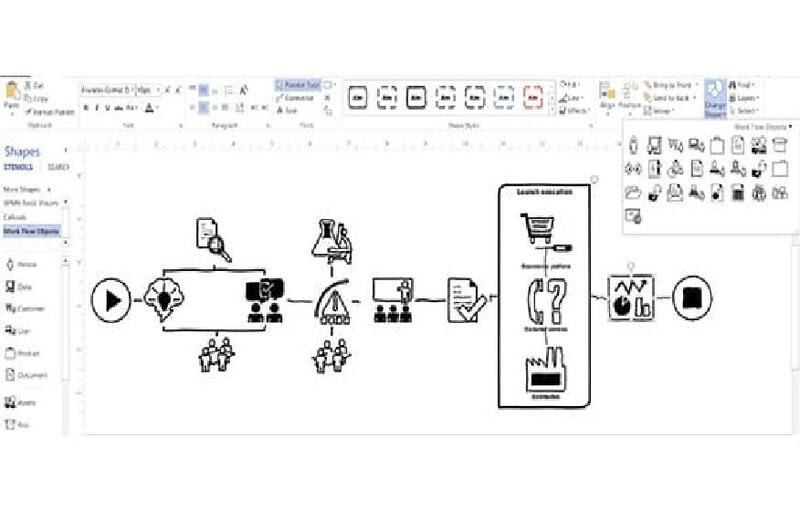 In Visio, text can be entered directly inside the shapes on the flowcharts. Shapes can be replaced without deleting any component. The Spellcheck option is enabled in Visio that eradicates the chances of silly mistakes and typos. Symbols can be automatically resized in order to fit in the text, and extra connector points can be added to them, even though multiple connector points are already in place. There is a Junction jog feature available, that creates bumps in a connector while crossing another connector line. The Visio's clipart gallery has in its store a huge number of symbols, shapes, and decorative objects, in which colors, fills and styles can be applied. There are different color and design themes available as templates for those who don't want to start a flowchart from a scratch. 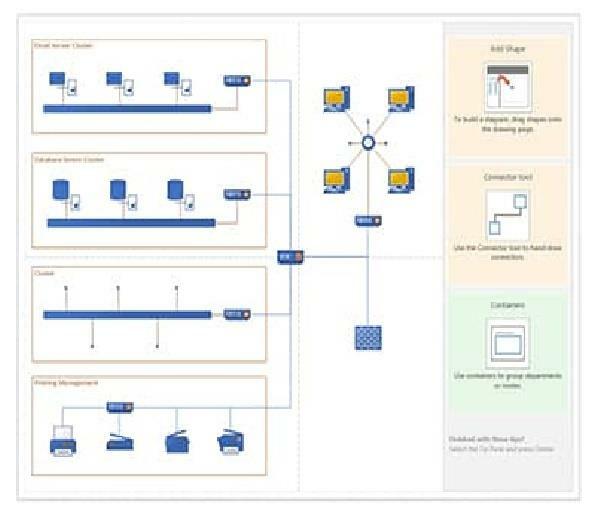 Creating a multiple-page diagram is easy with Visio which can contain more information stored under a single chart comfortably. Visio allows the canvas to expands by adding content and layers to the already created diagrams as and when required. Users can create charts from the data sources like csv files, to save time there's no need to copy and paste any information in the flowcharts manually. For better collaboration with one or more people Visio has included real-time collaboration tool to ensure that all the members of a group can observe the changes that are made by any of them. There are a lot of options in Visio that makes sharing your presentation easier than ever before. 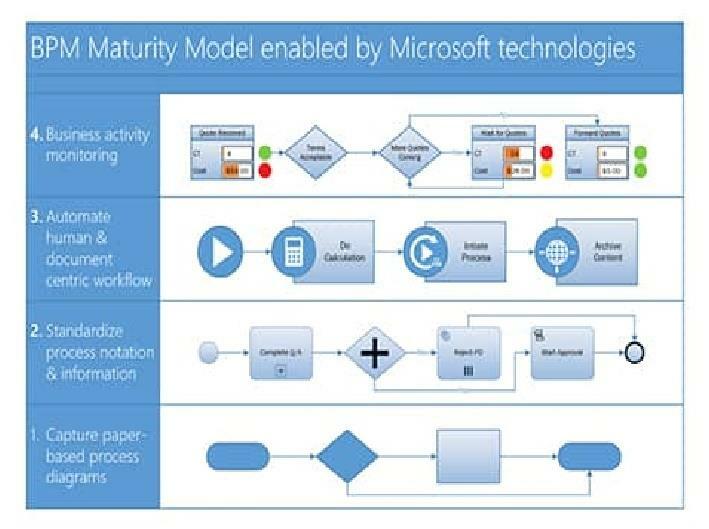 It is easy to send the flowcharts you want to share to your viewers through a viewer that can be downloaded from the Microsoft's website. You can simplify your chart either by expanding or by collapsing the groups of shapes that stand for each category. To refer any information on the go one can use the add links feature to the different sections of a flowchart. For enhanced security measures and to keep a company's proprietary information secure every diagrams and presentation work can be password protected. A user is free to assign other authorized users to get help in making the presentations. In other words a user has full control on who can see and edit his document. There is a presentation mode for meetings with clients in Visio. As an alternative, there is also the option of exporting one's presentations into HTML or PDF formats. There are options to create business process modeling notation (BPMN), organizational charts, diagrams and mind maps with Visio. Visio offers UML, Network and Venn diagrams as presets. Easy access to SWOT analysis and wireframes. For technical drawings and diagrams becomes easy because of the rule checking that can automatically create data legends. Visio has 70 types of diagram templates and 20 types of process templates and a huge number of starter diagrams. Visio provides a step-by-step tutorial with each template helping its users to get the hang of the program. For further assistance, their representatives are available through phone and live chat. The company's blog and user forums is another way to get through your queries and find an easiest solutions to them. Visio has an easy to use interface and one can easily navigate through it. The interface is consistently similar for all, both desktops and mobile. The software has a very handy set of features that make even the novices feel comfortable within no time. The creation, editing, and sharing of any kind of Flowchart or Presentation is a breeze with Visio 2016 edition, especially after it has introduced the online preview feature. Visio has a number of drawback till date as it has not been made compatible with iPads, Mac computers or Android tablets. What could be of a little hindrance is that it does not let the viewer edit the chart or add comments. Though that is a good thing for the sake of its security, it could make you feel restricted at times. Visio doesn't have a revision history feature to check the edits and updates that are done to any diagram which makes it inconvenient for the users as they have to manually save every version of their chart to keep a track on the changes that have been made. The software is not cloud-based, so one has to download it. Visio has proved to be one of the topmost flowchart software available because of its latest features, intuitive programming and templates with which one can easily create diagrams of any kind. To excel and become incomparable it needs to expand beyond its limitations of compatibility allowing every user to experience its more than satisfactory performance. Very disappointed that Visio 2016 does not provide the ability to restrict left click movement to hyperlinks in presentation mode. If the viewer inadvertently clicks on anything but the hyperlinks, they are automatically taken to the next page, with no obvious means of returning to the previous page. I know there are work arounds with the arrow keys, but it stops the whole flow of the presentation.